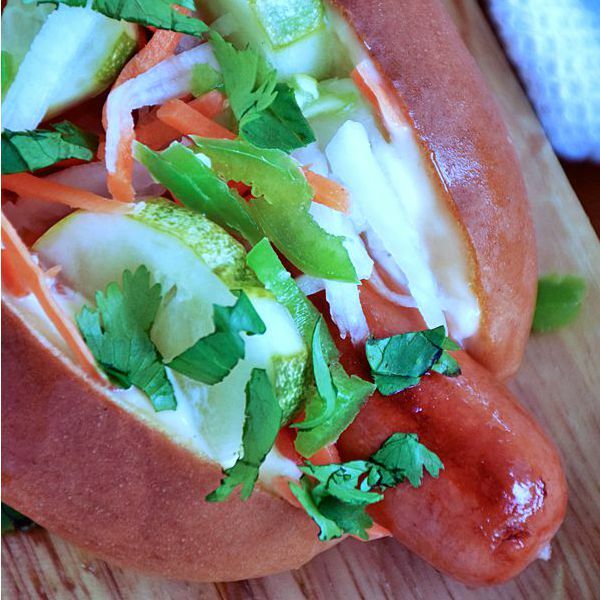 My Banh Mi Hot Dog recipe is inspired by the Banh Mi Vietnamese sandwich and takes the humble hot dog to a whole new level of gourmet deliciousness! 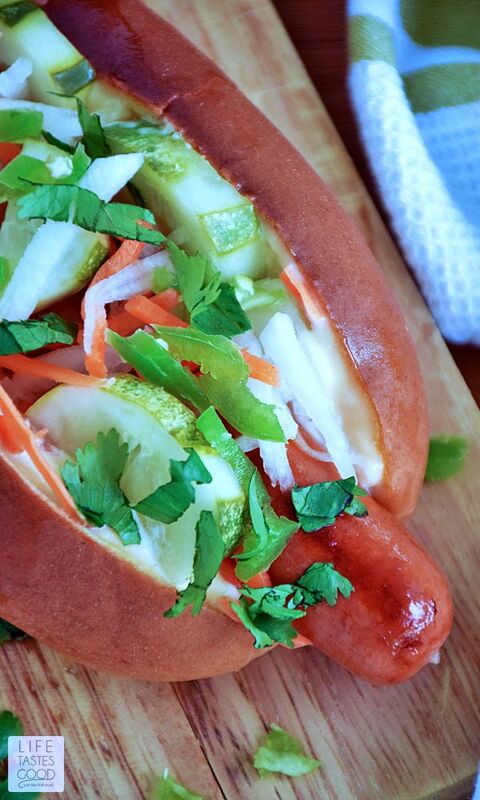 I've been busy in the kitchen testing Asian inspired recipes such as my Banh Mi Hot Dogs. 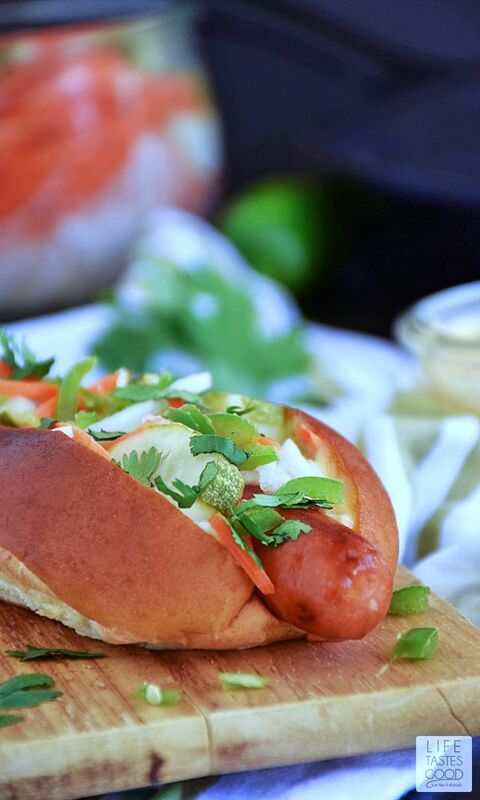 This Asian hot dog recipe starts with a sweet and soft hot dog bun slathered in a garlic chili mayo which holds a crunchy, all-natural hot dog topped with tangy pickled vegetable slaw, finely diced jalapeno peppers, and finished with fresh cilantro. It is a flavor powerhouse and quite simply the best hot dog I have ever eaten! My love affair with the Vietnamese Banh Mi started last year, and now I look for any reason to enjoy the complex flavors that make up this favorite street food sandwich. Click here for my Vietnamese Pork Sandwich Recipe-Banh Mi. Recently I made some Bread and Butter Pickles that were a big hit with everyone who tried them. So much so, I ended up buying loads of cucumbers to make jar upon jar of these sweet and tangy little bites of deliciousness. 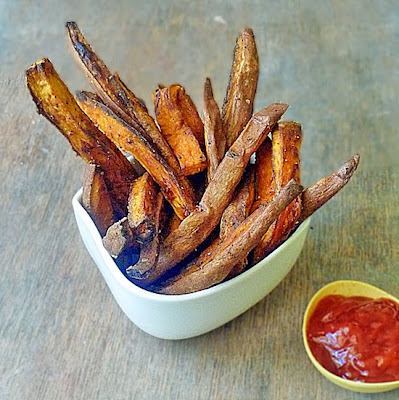 Don couldn't get enough of them, and everyone who tried them either wanted the recipe or wanted me to make them a jar. 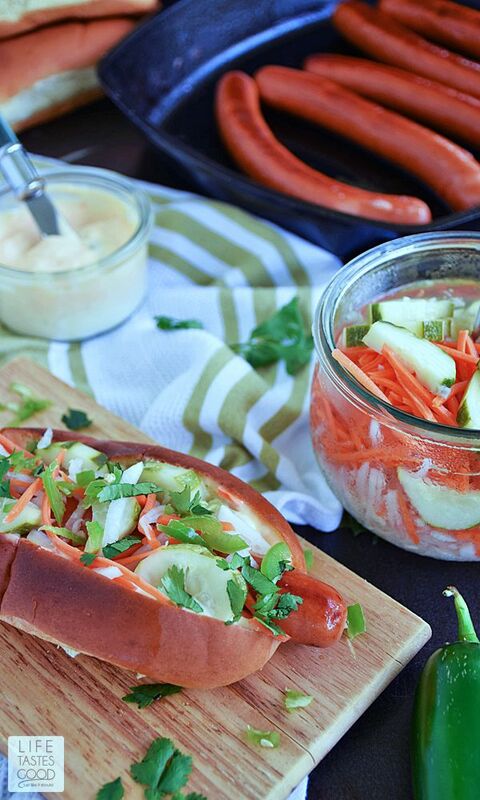 The idea for these Banh Mi Hot Dogs hit me like a ton of bricks while I was pickling all those cucumbers. It reminded me of the Pickled Vegetable Slaw I shared with you last year. That memory coupled with a rare craving for hot dogs is how this recipe was born. We aren't big hot dog eaters, but when you get the hot dog itch it must be scratched! I use natural casing hot dogs for their crunch and overall higher quality. I recommend Thumann's or Applegate hot dogs. Both of these brands are all-natural and have that snappy crunch I crave when eating this favorite All-American treat. A hot dog with that snappy crunch contrasts nicely with a soft bun making each bite a satisfying experience. 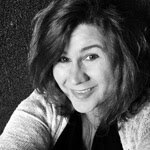 The satisfying sensory experience doesn't stop there! Oh no! 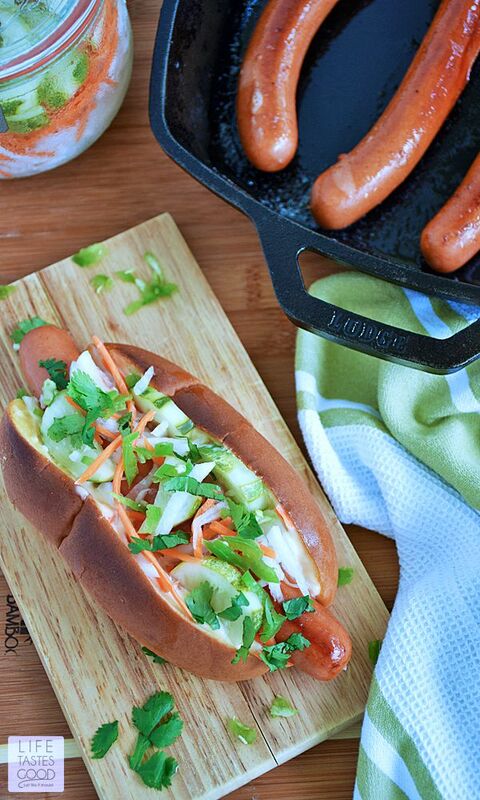 As is common in Vietnamese Cuisine, all five senses get a workout when you enjoy these Banh Mi Hot Dogs! 6 All-Natural Hot Dogs. I recommend Thumann's or Applegate hot dogs. 6 Hot Dog buns, lightly toasted. I recommend Pepperidge Farm Top Sliced Sweet and Soft Hot Dog Buns. Prepare Pickled Vegetable Slaw according to the recipe early in the day or a day ahead and store covered in the fridge until ready to use. Combine 1/2 cup mayonnaise with 1 teaspoon freshly minced garlic, 1 teaspoon sweet and sour sauce, a pinch of kosher salt, and a pinch of sugar. Mix well to combine and refrigerate until ready to use. Melt 2 tablespoons butter in a skillet over medium heat. Saute hot dogs in skillet until well browned on all sides and cooked through. While hot dogs are cooking, place buns under the oven broiler to lightly toast. Watch them carefully as they will burn quickly and we don't want that! When buns are nicely toasted, remove them from the oven and spread the mayonnaise mixture onto both sides of each bun. Top bun with a fully cooked hot dog and add Pickled Vegetable Slaw on top. Garnish each with 1 teaspoon finely diced jalapenos and freshly chopped cilantro. Serve and enjoy! I love Banh Mi!! 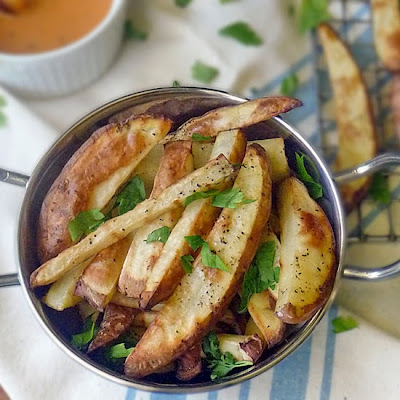 I love the fresh ingredients and combo here!! Now THIS is a scrumptious way to eat hot dogs! Love all your toppings, Marion! What a fun Asian-American fusion recipe! Okay, first I have to admit that I love hot dogs. And second I think I have found my newest favorite. Of course, I have to make it to know for sure. It sure does look mighty tasty. This is very creative! My kids love hot dogs and this is a great way to take hot dogs to the next level! Love it. What a great take on hot dogs!